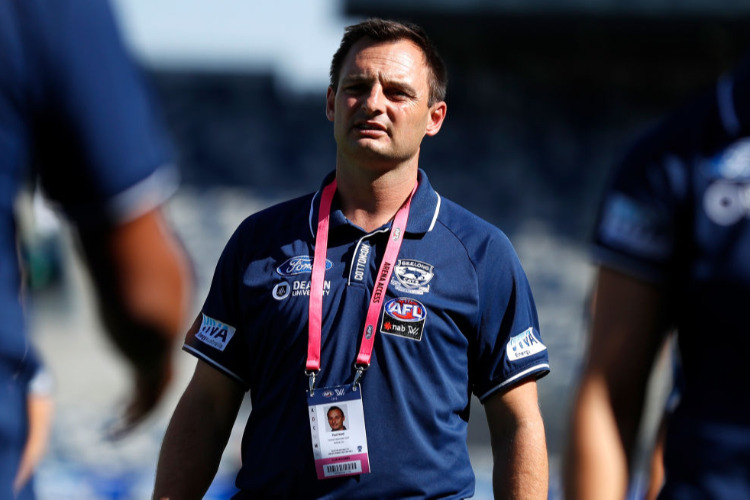 Geelong coach Paul Hood conceded his side's inexperience was exposed by the Western Bulldogs in their AFLW loss to the reigning premiers. A determined Geelong insist they won't be bowed by the double-blow of their first AFLW defeat and the loss of top draft pick Nina Morrison. The Cats were brought back to earth on Saturday night, going down to the Western Bulldogs 5.4 (34) to 2.4 (16) at Whitten Oval. It came just days after the Cats lost 18-year-old Morrison for the rest of the season. The Cats were on cloud nine after defeating Collingwood in their first AFLW game last week but their lack of experience was exposed by the reigning premier Bulldogs, who snatched the lead early in the second term and didn't look back. "I think it's just pure inexperience," coach Paul Hood said. "The Bulldogs have played at this ground and are now in their third season. They've had some tremendous success and a good method, and they tested ours a little bit. "The fact they were able to put some scoreboard pressure on meant that maybe our possessions meant a little bit more and the players were a bit nervous. "We'll get better for the experience. It's great to test ourselves against good teams and we look forward to coming out again next week and improving a little bit more." Morrison is the second consecutive top draft pick to suffer a season-ending knee injury after the Bulldogs' Isabel Huntington sustained a similar injury early last season. Young gun Morrison dominated on debut, collecting 22 disposals and kicking the winning point in the win against Collingwood. "I think it probably galvanised the team if anything," Hood said. "They worked really hard, they fought so hard for long periods of the game and really took it up to a really good team. "Nina is travelling pretty well, as well as can be expected. She's a really resilient person and she's already got a plan in place as to how she's going to get back better than ever." Veteran Aasta O'Connor limped to the sidelines with a corked leg in the third quarter and played no further part in the game. Hood said O'Connor, who has also previously torn her ACL, would have scans to investigate potential structural damage.